Image / file upload should always have a progress bar. It is a feature that most of the developers ignore. It should be seen as part of the functionality. The users cannot sit in the dark and keep guessing about the background progress. When the user requests the server to perform some operation, it is good to show them about the progress. It is a good UI/UX behavior. The progress bar is one of the best ways to show the status of the in-progress operation. We have already seen how to show a dynamic progress bar to display file upload progress. 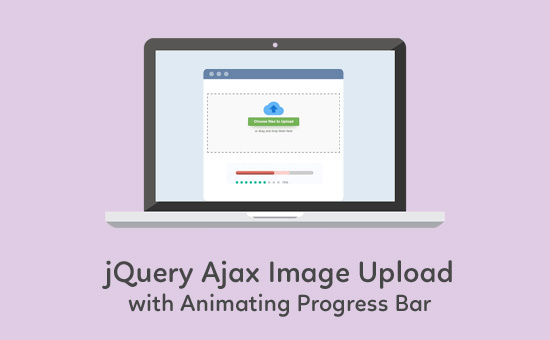 In this example, let us learn to create an animating progress bar using jQuery while uploading an image via AJAX. A file input option is used to choose the image and the file binaries are posted to the PHP via AJAX. After sending the file upload request to the PHP, the AJAX script initializes jQuery animation to show the file upload progress bar. The progress bar will highlight the progressing percentage with jQuery animation. The jQuery Form plugin is used in this example code to handle the AJAX image upload with progressive status. The landing page will show a HTML form with the file input. Users will choose the file and post the file data by submitting the form via AJAX. The jQuery and jQuery Form library is included at the beginning of the script. A minimal jQuery validation script is added to check if the image file had been chosen before submitting the form. The jQuery form library is used to submit the form via AJAX with an animated progress bar. The ajaxForm() function is used to submit the image file binaries to the PHP. The progress of the image upload is shown with a progress bar in the uploadProgress callback function. Also, the jQuery animate() method is called to create the progressing effect on the progress bar element. This is the usual PHP code used to upload the image file to a specified target folder. The file data are stored in the $_FILES superglobal. PHP move_uploaded_file() function is used to copy the submitted file to the target uploads folder. 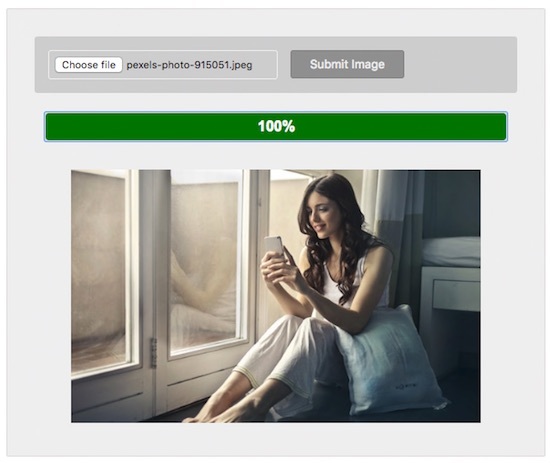 This is the output of the Ajax image upload example with progress bar using jQuery animation.